I have, literally, a fridge full of rhubarb. See, lovelies, sometimes I go to the farmers market and get all these grand ideas in my head. Ideas of apparently having 80 hours in each of my days as opposed to only 24. Ideas that I am going to buy a myriad of produce and have enough time to make salads, egg scrambles with fresh kale, batches upon batches of jam, batches upon batches of pesto. This is all wonderful if, as aforementioned, there were 80 hours in each day or perhaps if there were 3 more of me. So, alas, here we are in my little predicament of having a fridge full of rhubarb. The good news is rhubarb is pretty friendly. Aside from needing a little pickling or cooking down with sugar, rhubarb is a pretty mellow little fella (don’t as me why I think rhubarb is male. Especially bizarre since it is pink/red. My brain is funny sometimes). There are plenty of pretty simple and fast things you can do with rhubarb to use it up. But the recipe below is a new one for me. 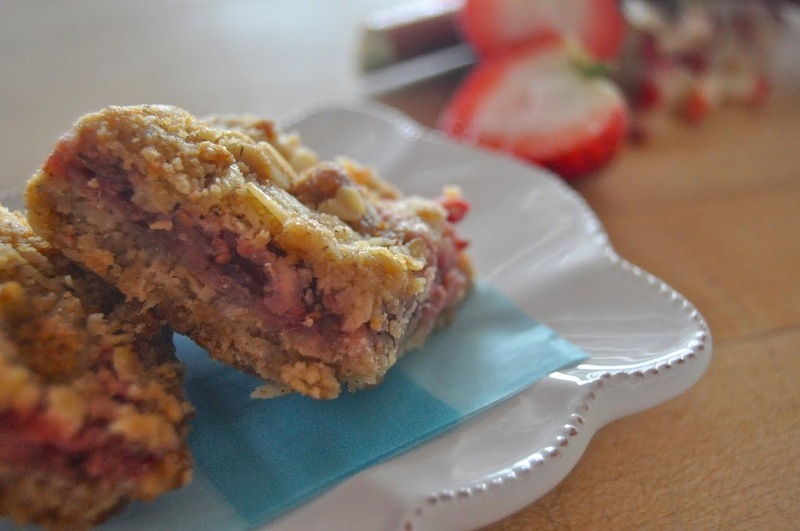 I was looking up strawberry rhubarb crisps, strawberry rhubarb crumbles, etc and then thought-why not make a cookie bar?! Everyone loves a little cookie they can pick up and pop in their mouth and who doesn’t love something with an oat crumble on top? Hence these bars were born. Tasty all on their own, they are also delicious crumbled up with some Greek yogurt on top or for a decadent treat, warmed with vanilla gelato or coconut milk ice cream. Plus, because the recipe is so easy this would be a great thing to do with the kids now that school is out! Get them in the kitchen and let them help you, it’s great for you and great for them. 1. Preheat oven to 375. Line an 8×8 baking dish with parchment paper. 2. Mix together the oats, gluten free flour, brown sugar and sea salt. Drizzle in the melted coconut oil and melted butter and mix with a fork until it is crumbly like sand. Remove ½ cup and set to the side for later. Pour the remaining mixture in the 8×8 parchment lined baking pan. Press into the pan with the back of a fork. 3. Put the strawberries and the chia meal in the bowl of a small food processor and pulse a few times. 4. Sprinkle half the rhubarb, half the pulsed strawberry-chia mixture 1 T. lemon juice and 1 T. of the cane sugar over the top. Repeat. 5. 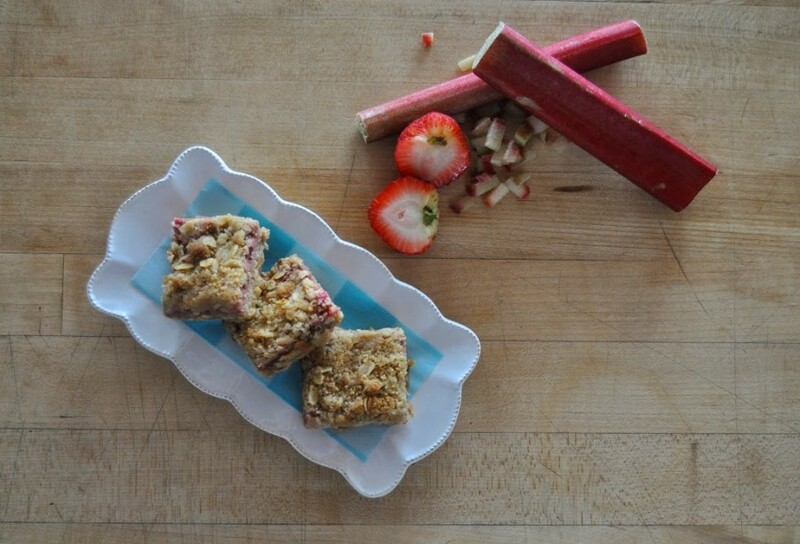 Finish by sprinkling the reserved ½ cup oat topping evenly over the strawberry rhubarb layer. 6. Place in the oven for 30 to 40 minutes until lightly browned and smelling delicious! ** To make dairy free simply substitute equal amount of melted vegan margarine for the butter. Thank you for sharing this delicious recipe. I am definitely gonna make this nutritious food this weekends. Surely my family will love it.